One of the most rewarding experiences as a parent happens when your child begins to read. It's no secret that I read to my children every night before bed, something I've been doing since they were babies. But the last few weeks have been a mixture of the usual Mommy reading with a smattering of 6 year old reading. Tonight as we were reading Henry and Mudge Puddle Trouble, I felt such pride to hear that little guy reading. I listen to children reading all day long, but there is something magical about hearing my own son sound out, read and discuss books. 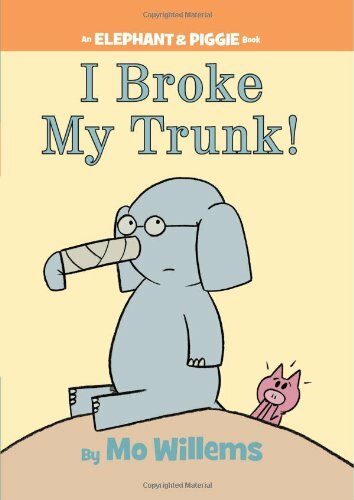 The ah-ha moment when I realized, wow, my son can read really well, came a few weeks ago when he brought home the book I Broke My Trunk by Mo Willems from the school library. I am a huge fan of Mo Willems! When I taught first grade we did an author study on Mr. Willems. One of my all time favorite children's books is Knuffle Bunny: A Cautionary Tale and you can't go wrong with Elephant and Piggie's silly stories. I was actually really excited that my son picked out an Elephant and Piggie story. As we pulled the book out to read before bed one night, probably the night before it was due, I told my son he should read the book to me. His initial reaction was, "No, I can't read this." (For some reason, early readers always seem to assume they can't read.) So, I actually talked him into trying it out and he read the entire book. Not only did he read the entire book, but he started cracking up about halfway through the book, when Gerald, the elephant is explaining to Piggie how he broke his trunk, which was fantastic because it told me that not only was he reading, but he was understanding what he was reading. Now don't worry, I'm not going to tell you what was so funny or how the elephant broke his trunk. You're going to have to check this one out yourself! This book is also a great partner read. After my son read the story by himself, we chose parts. I was Piggie and my son was Gerald. The story is written through a series of speech bubbles, so I read the Piggie speech bubbles in my best Piggie voice and my son read the Gerald bubbles in his best elephant voice. The second reading brought just as many belly laughs as the first read and also helped with my son's fluency. I promise, you won't be disappointed. Another Elephant and Piggie book made it's way home this week and I can't wait to read it!